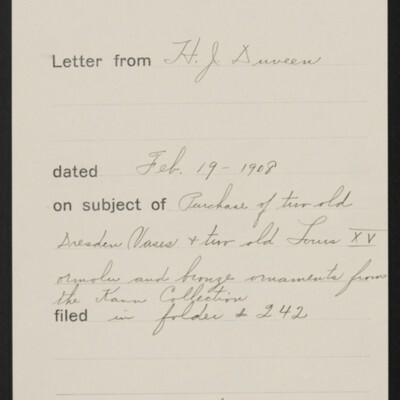 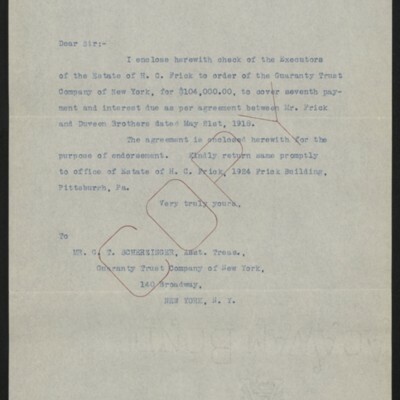 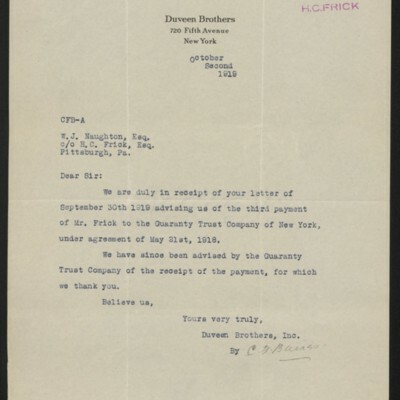 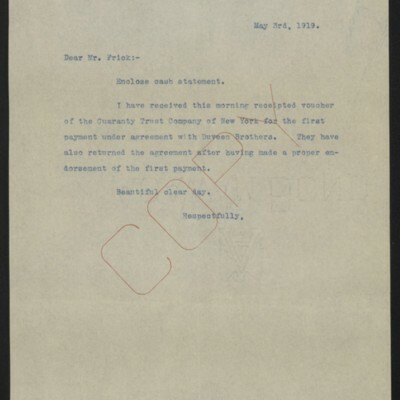 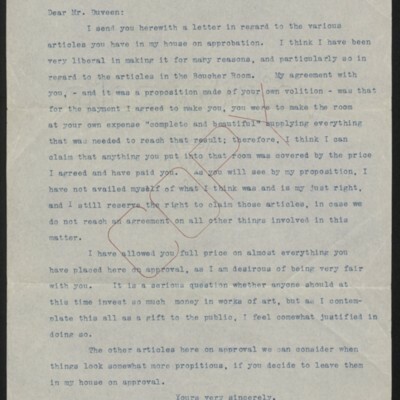 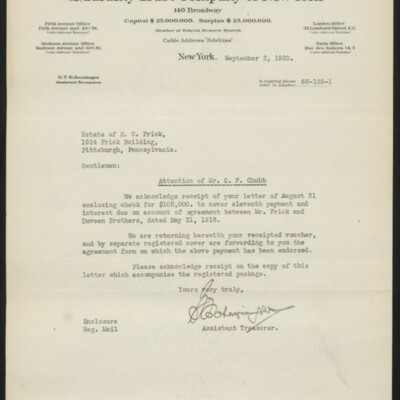 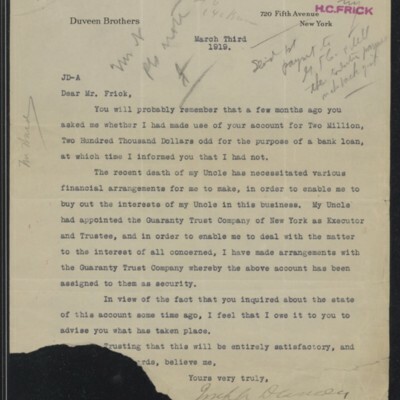 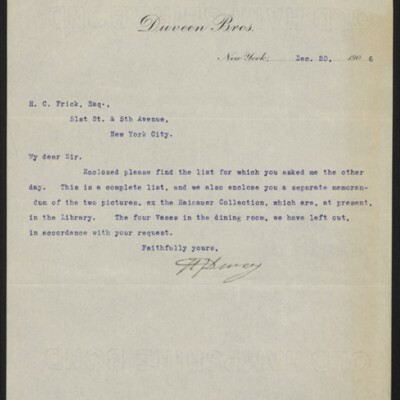 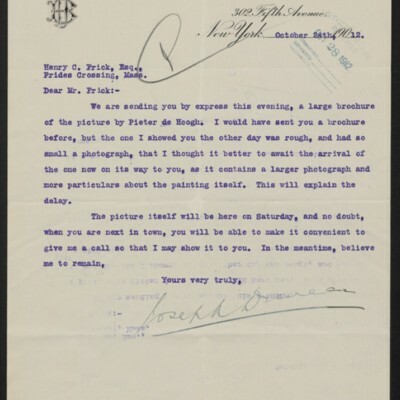 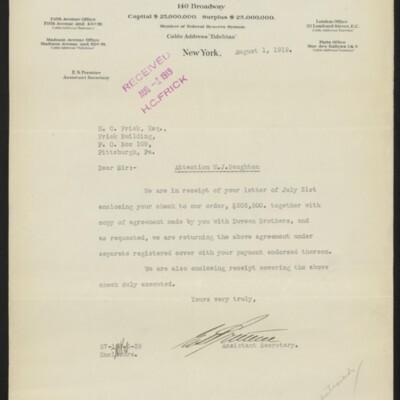 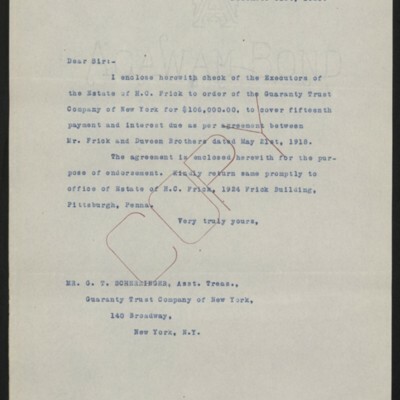 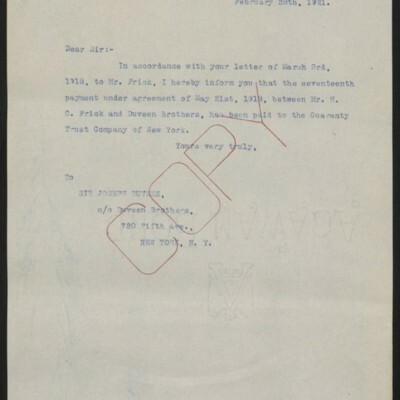 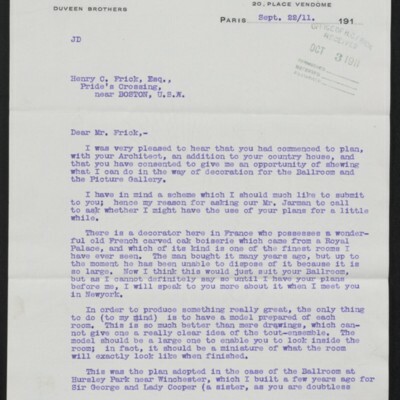 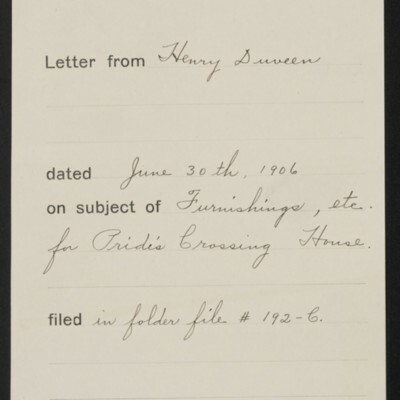 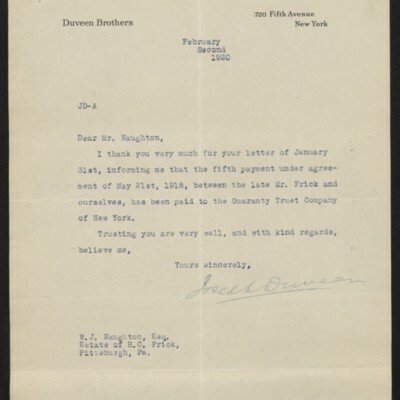 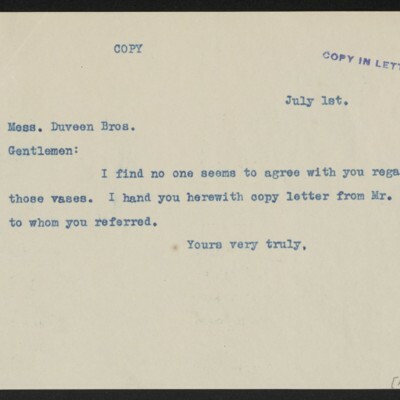 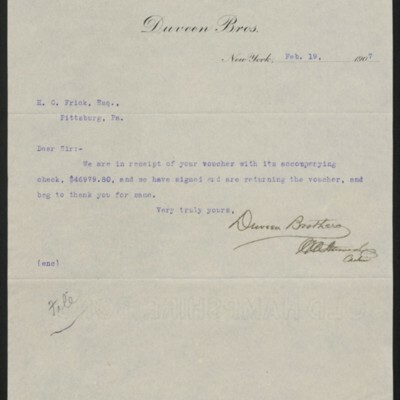 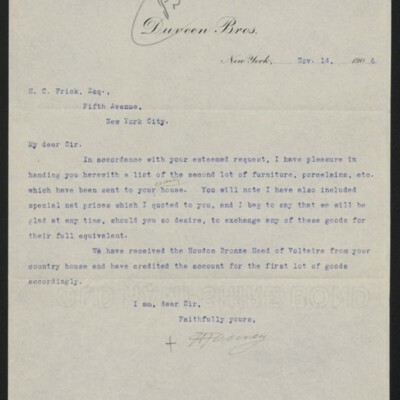 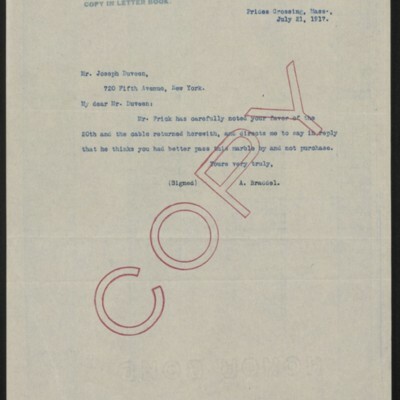 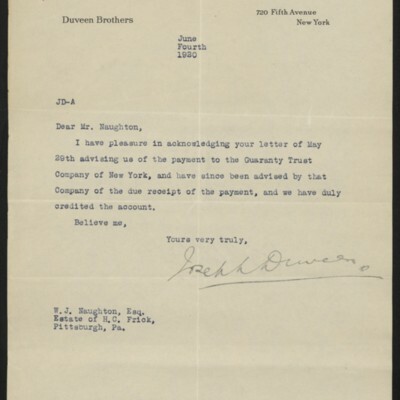 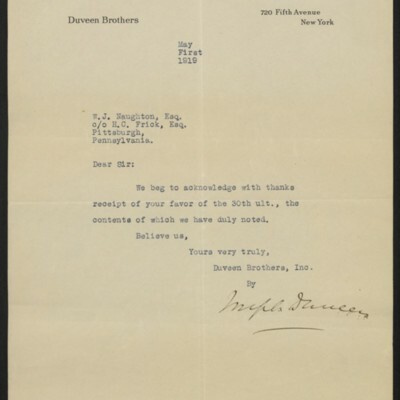 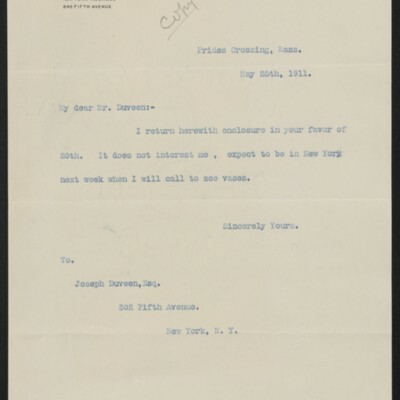 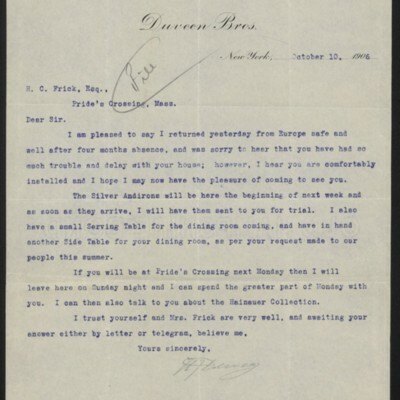 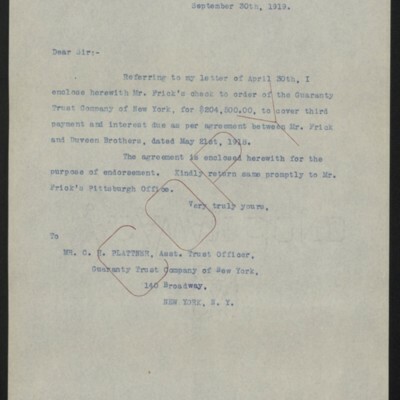 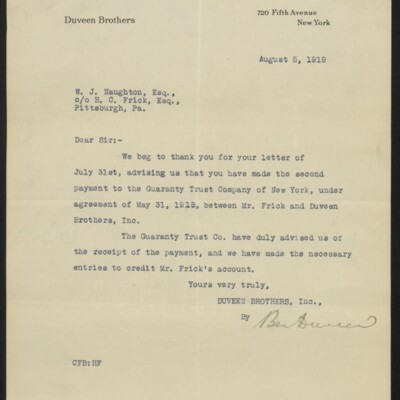 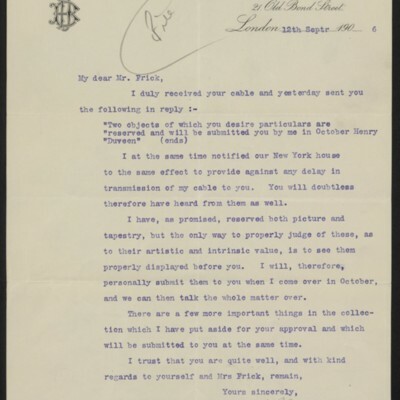 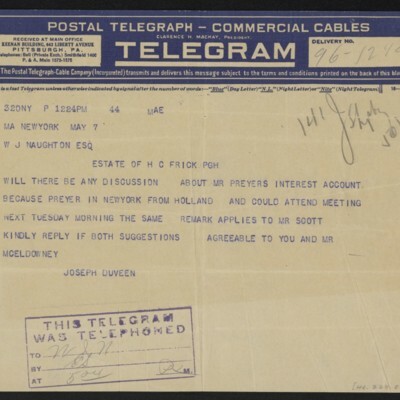 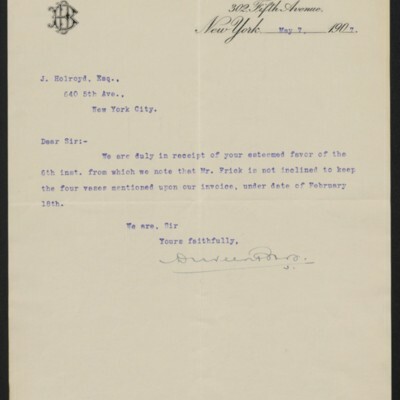 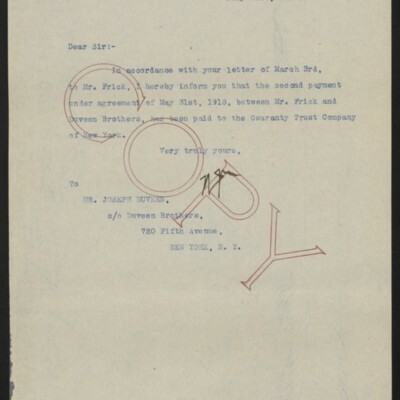 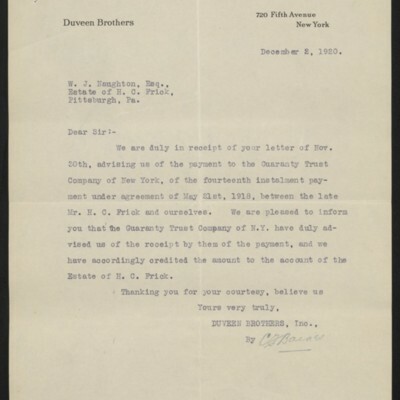 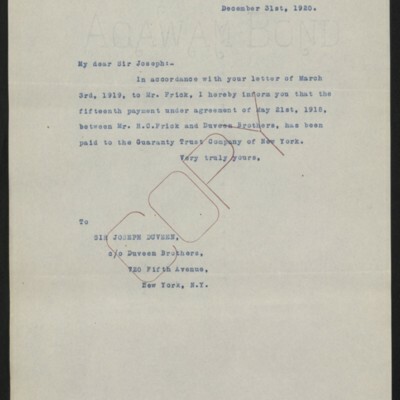 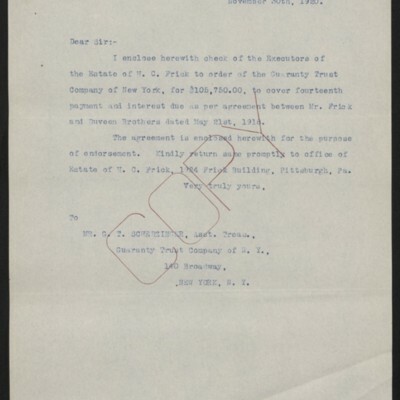 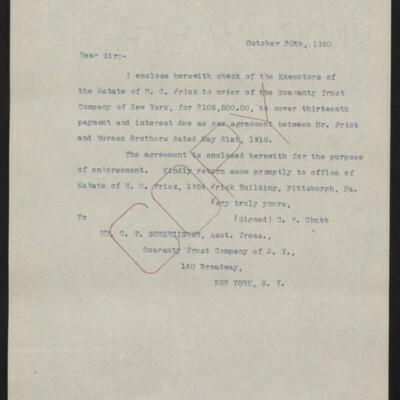 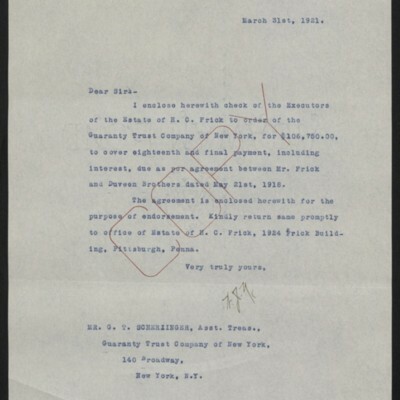 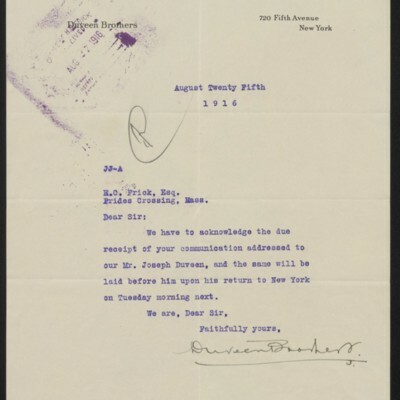 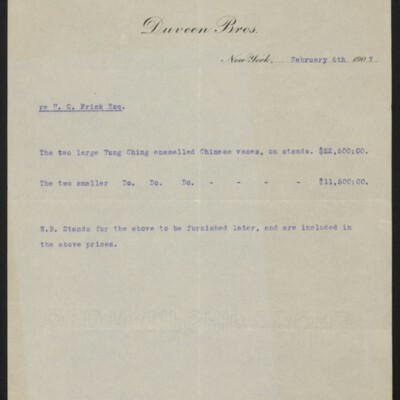 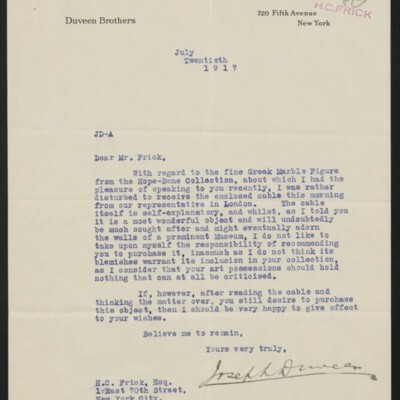 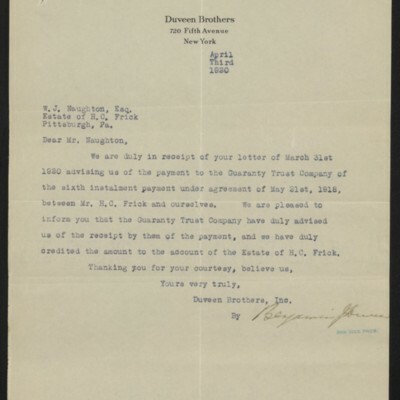 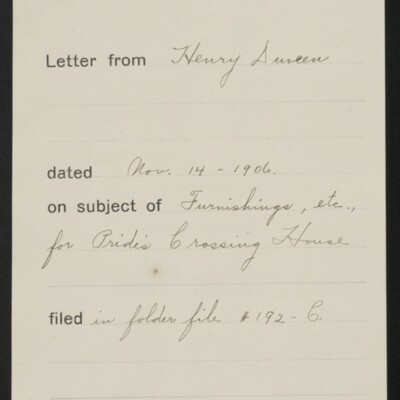 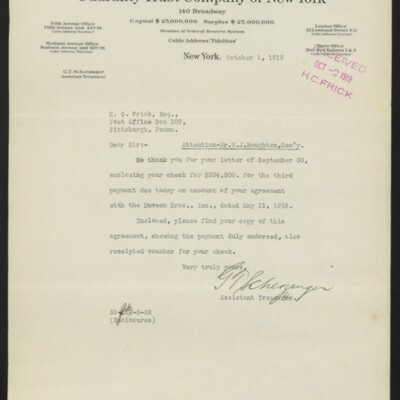 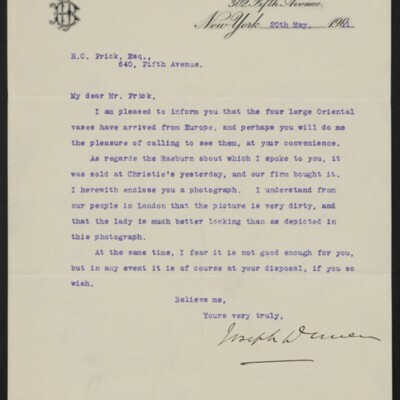 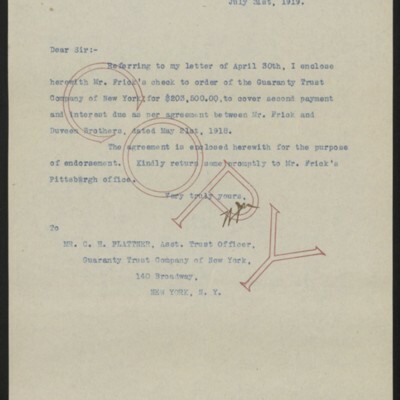 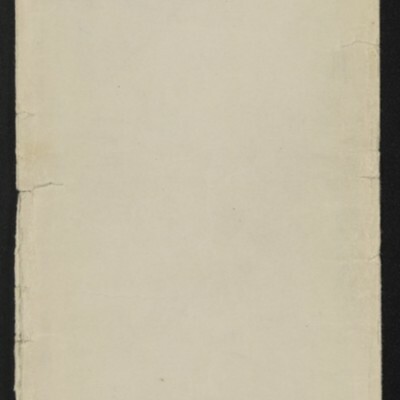 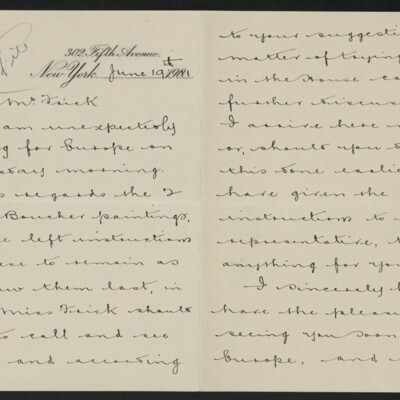 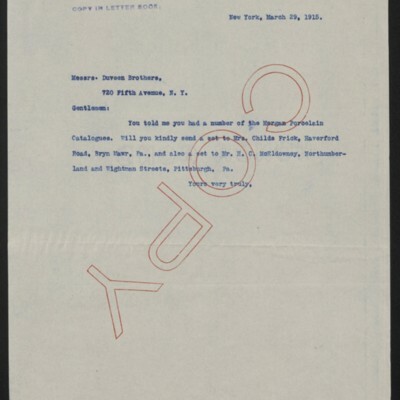 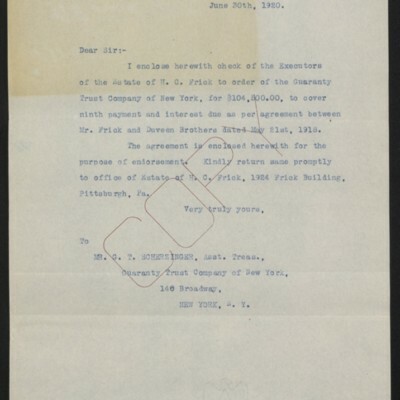 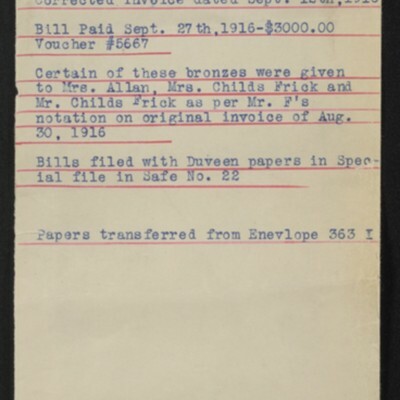 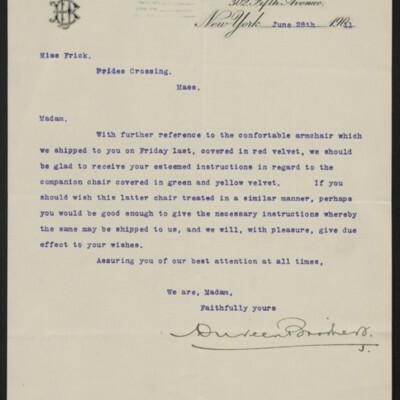 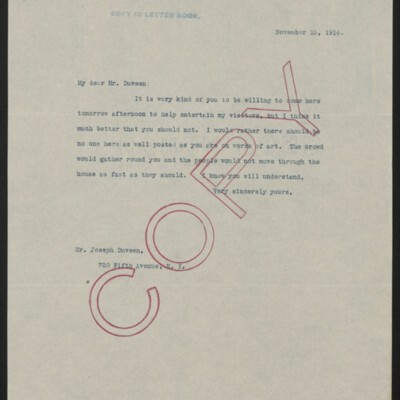 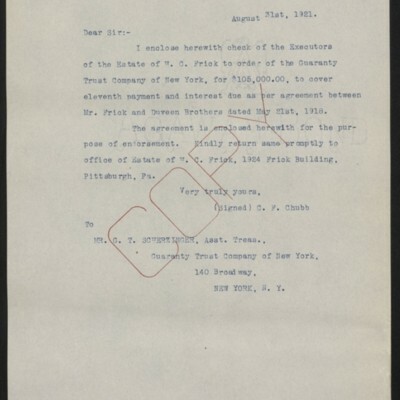 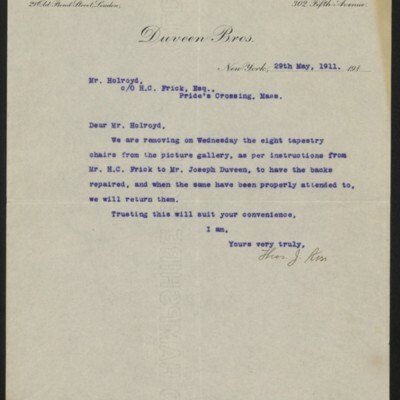 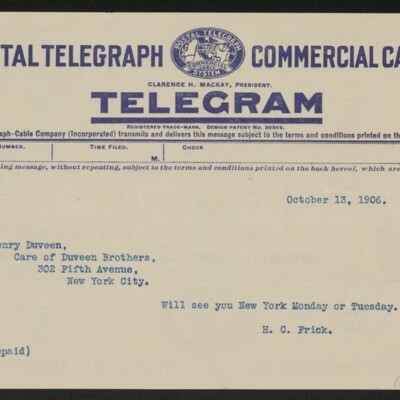 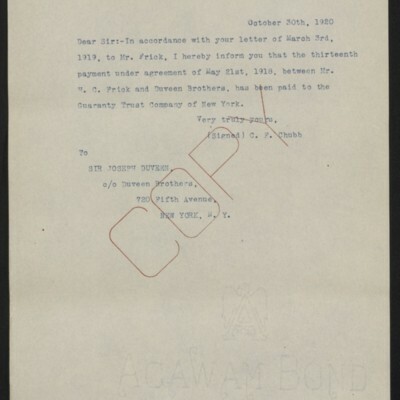 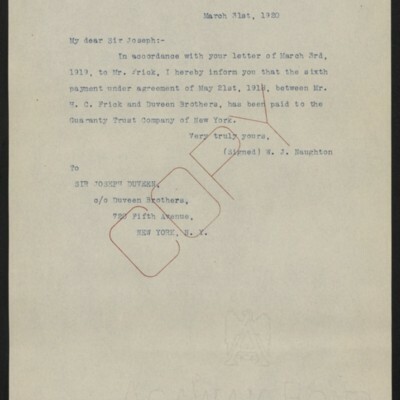 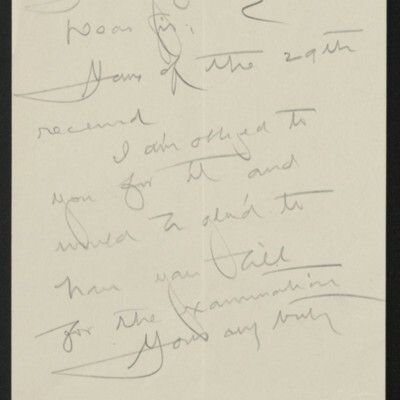 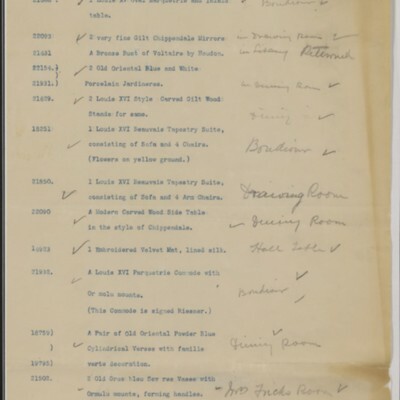 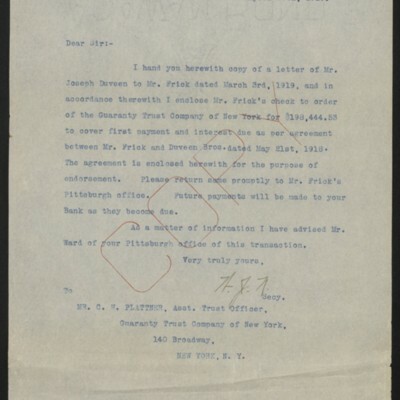 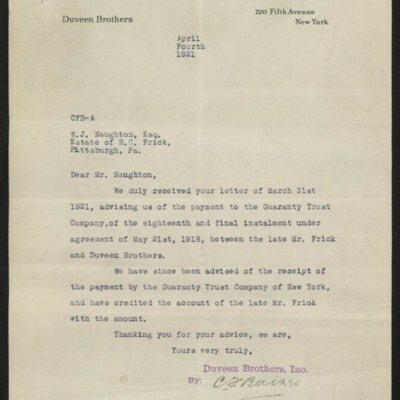 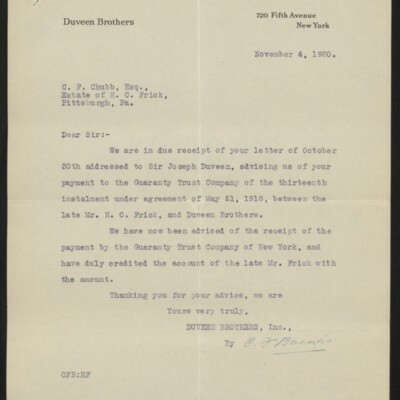 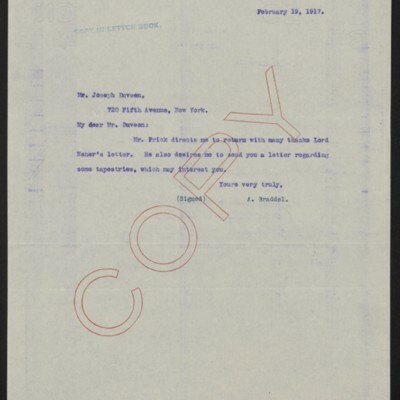 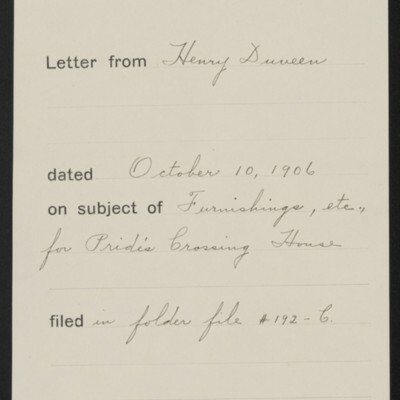 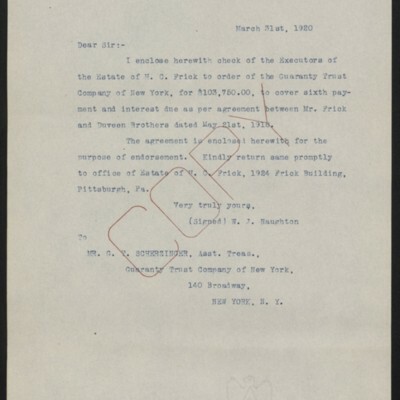 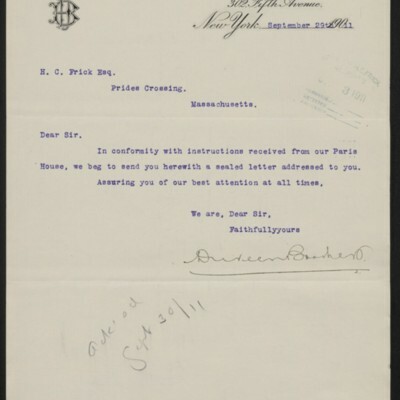 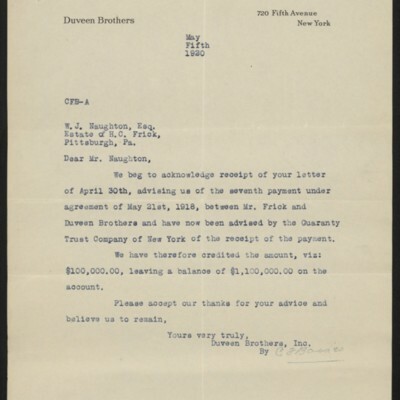 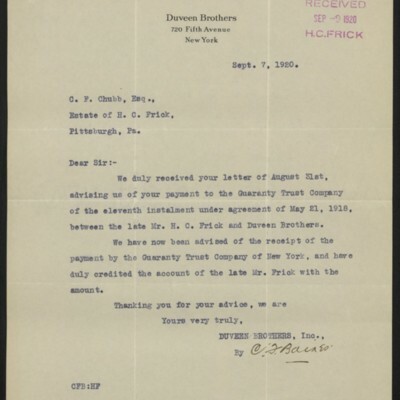 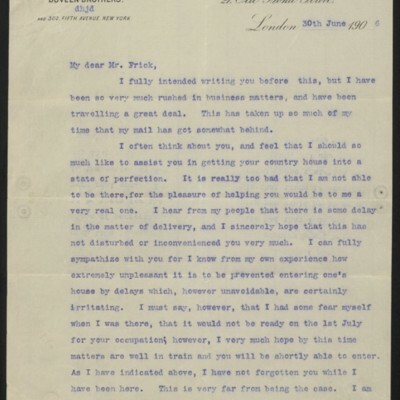 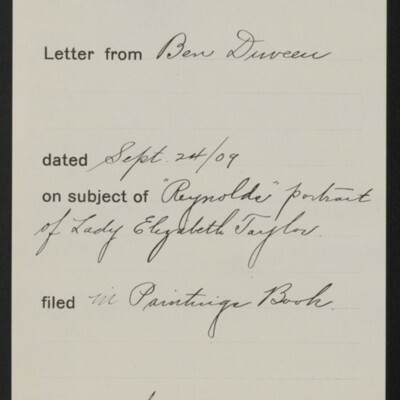 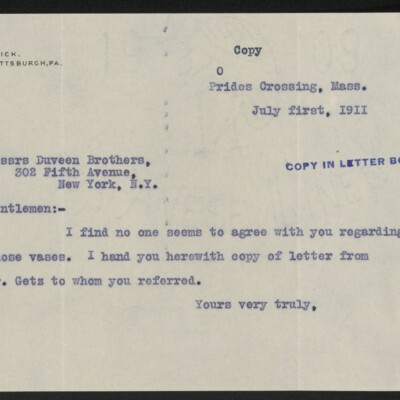 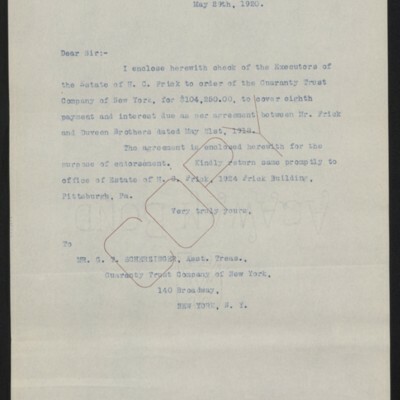 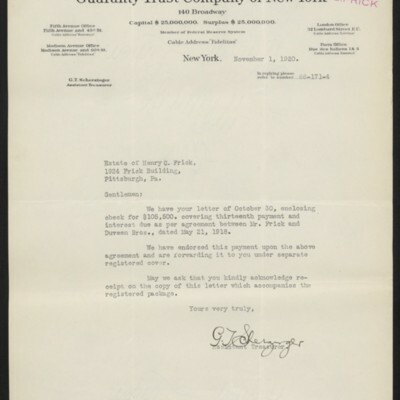 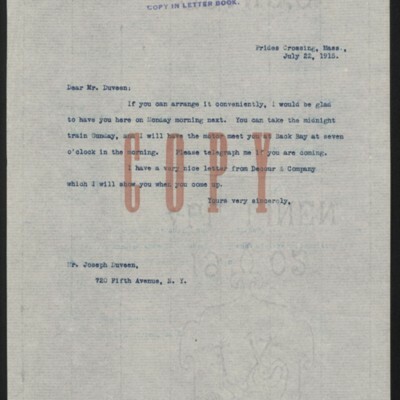 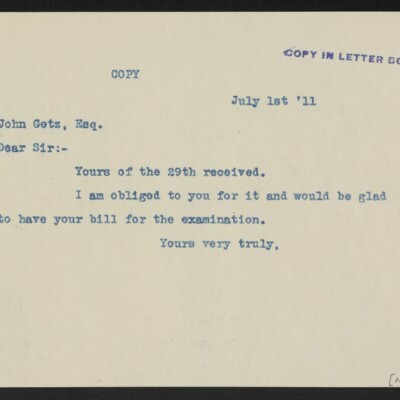 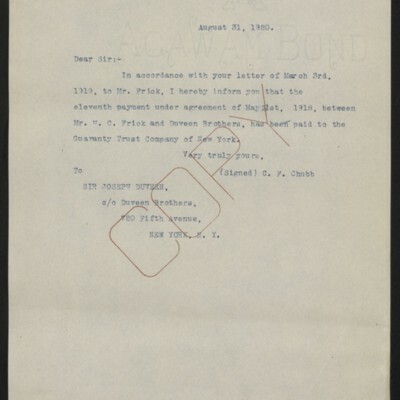 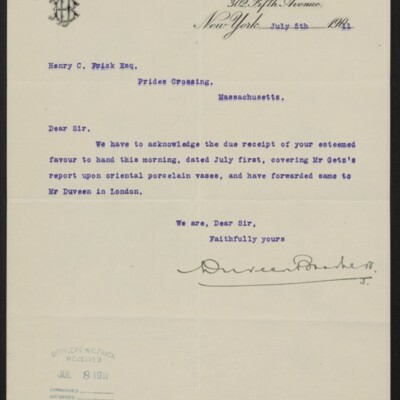 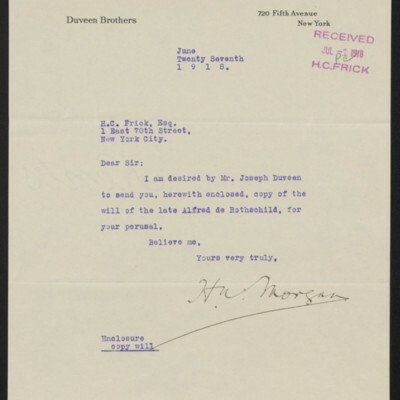 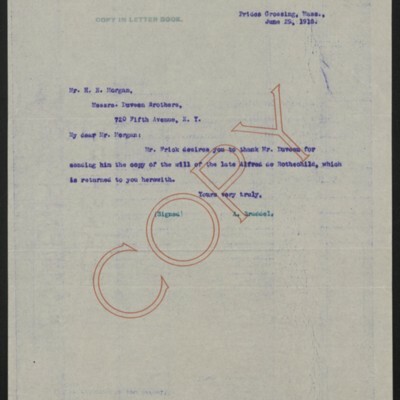 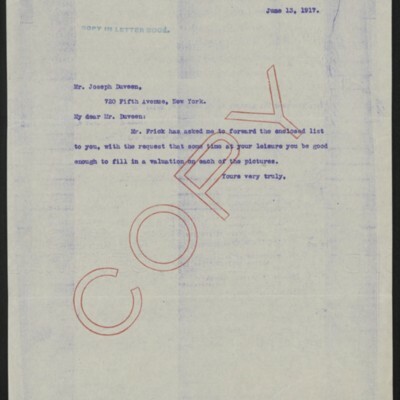 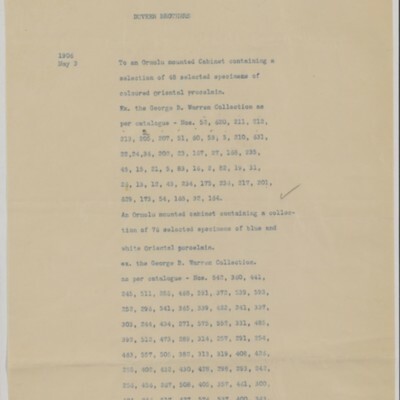 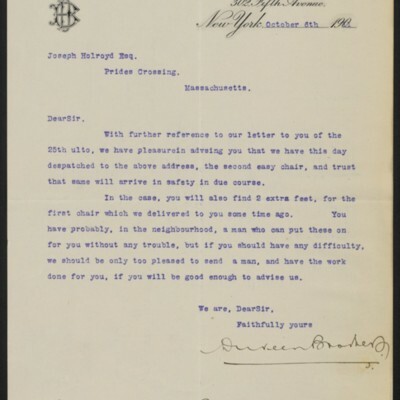 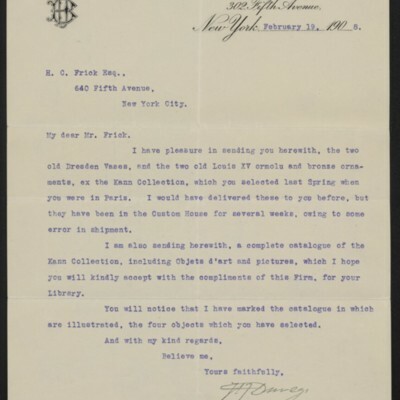 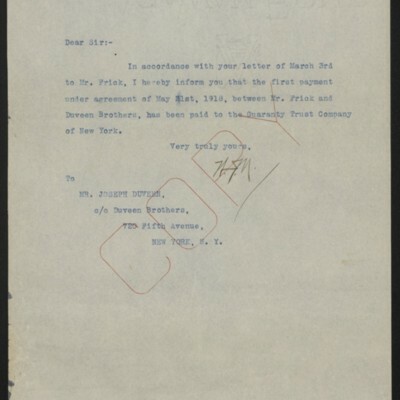 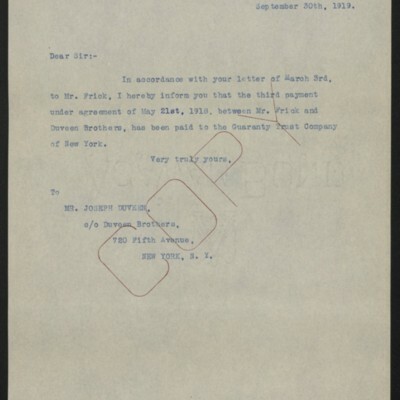 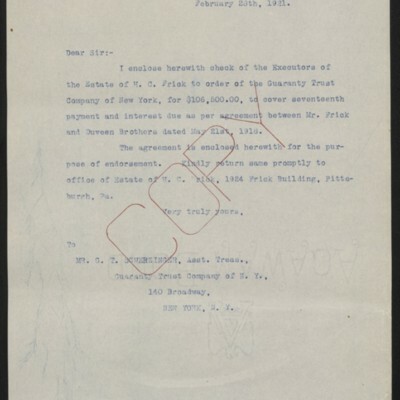 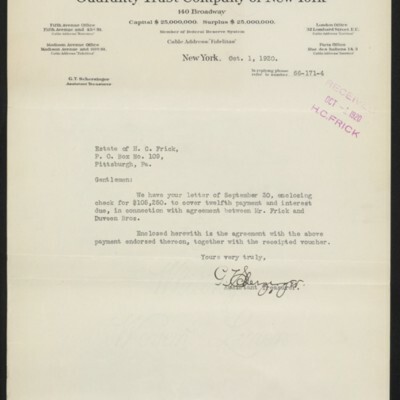 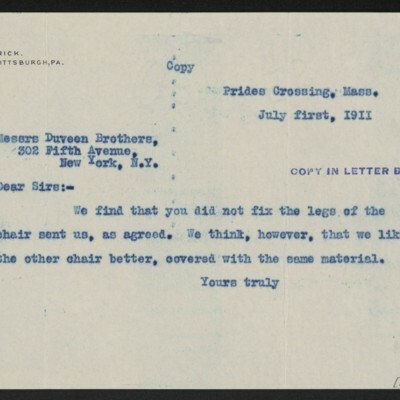 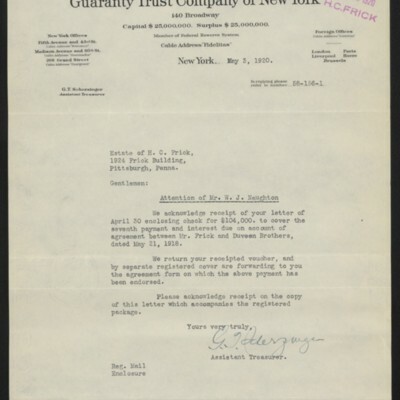 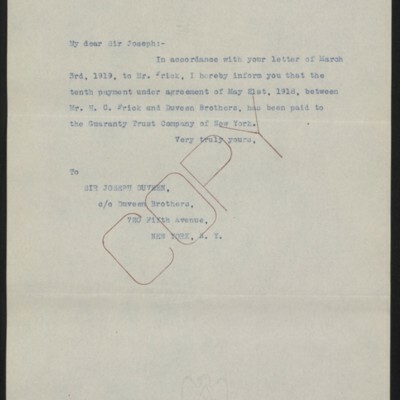 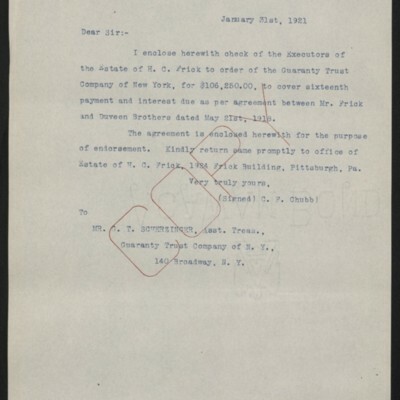 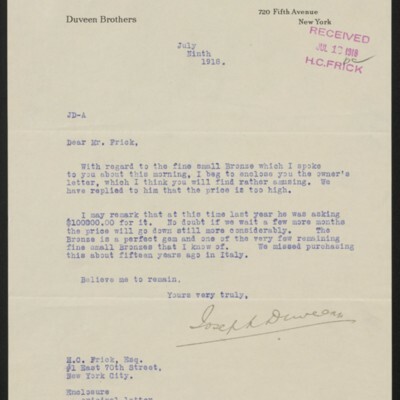 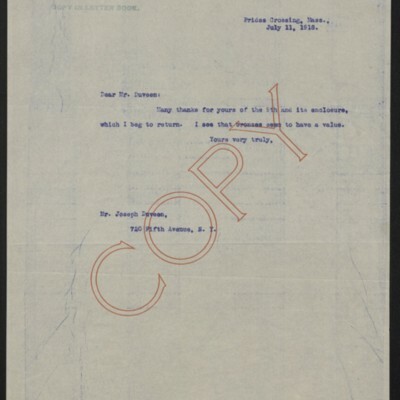 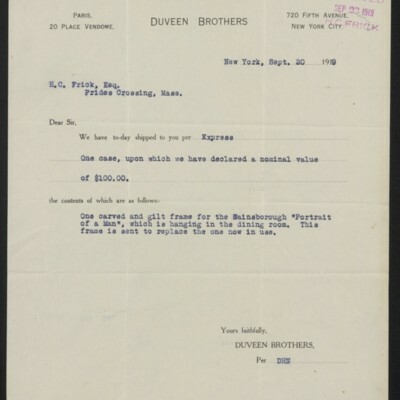 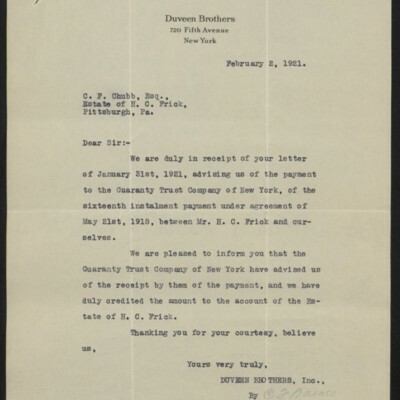 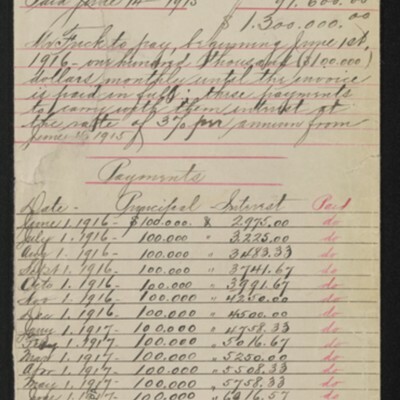 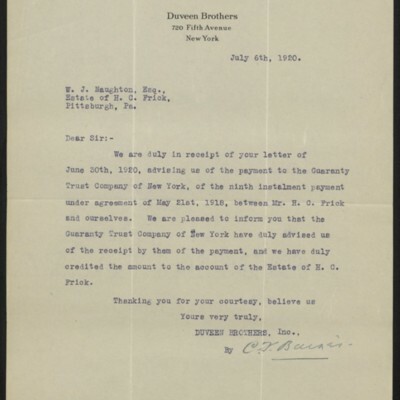 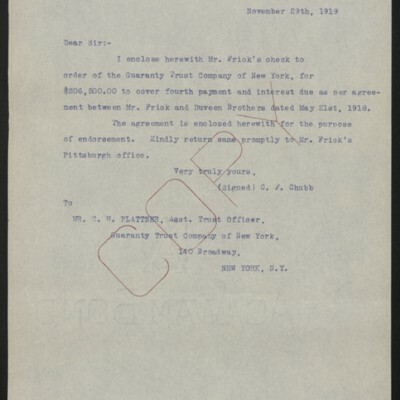 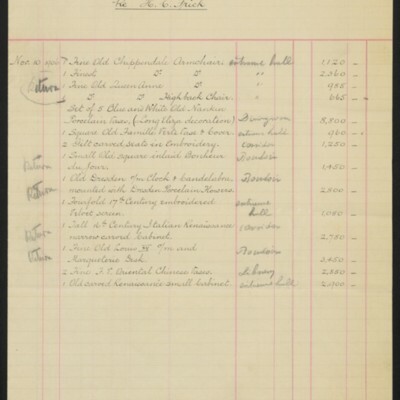 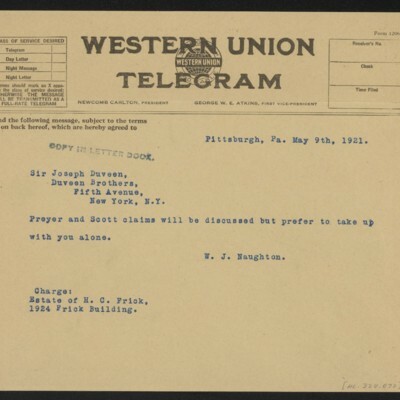 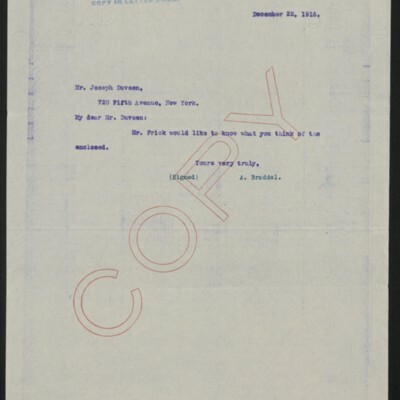 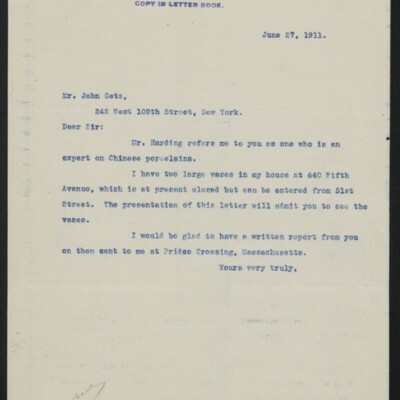 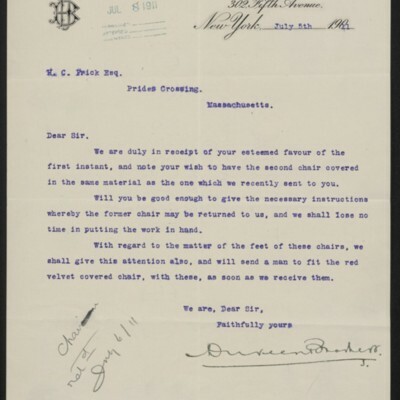 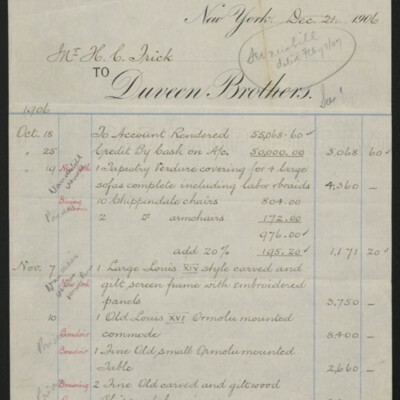 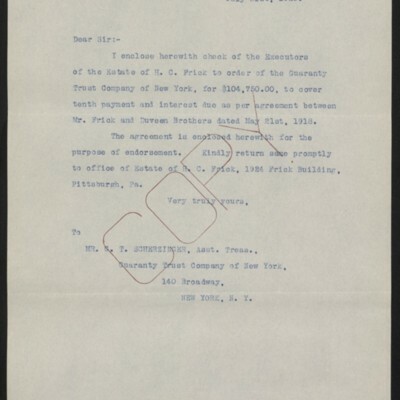 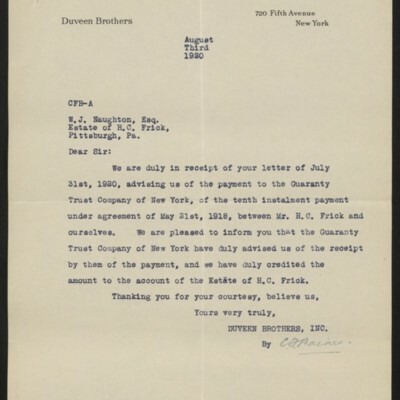 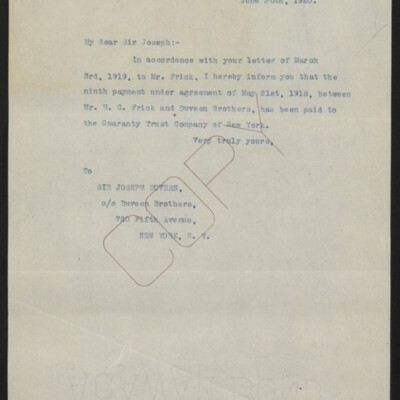 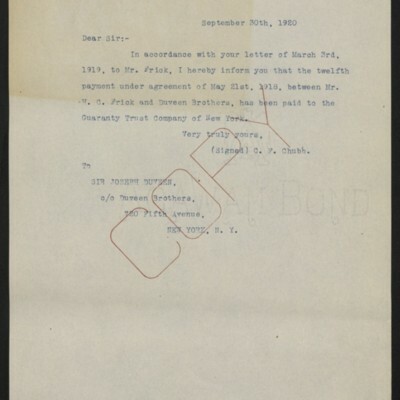 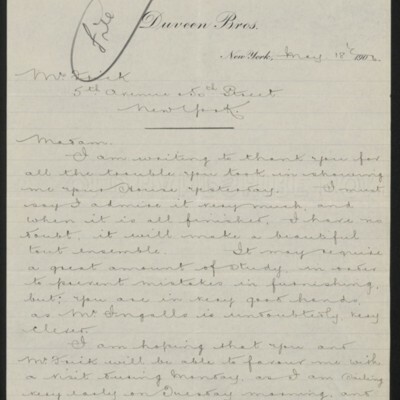 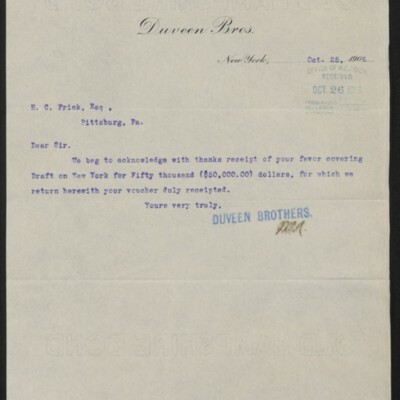 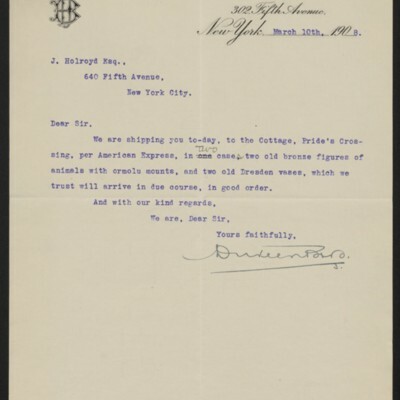 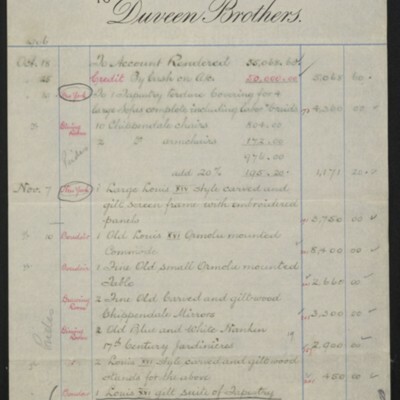 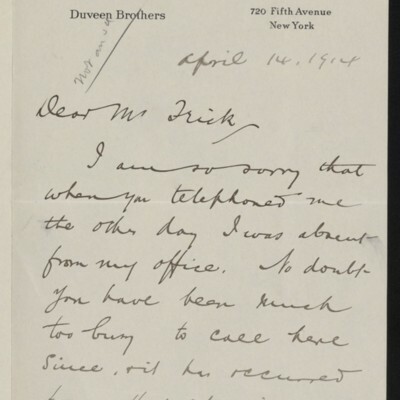 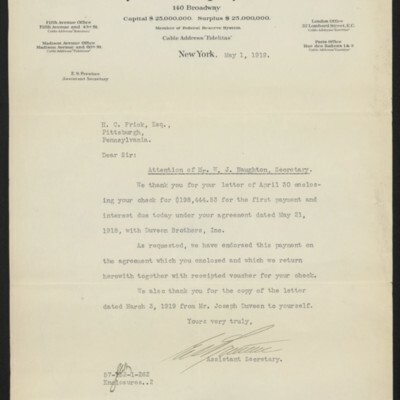 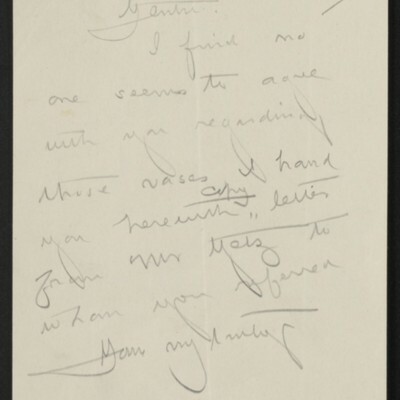 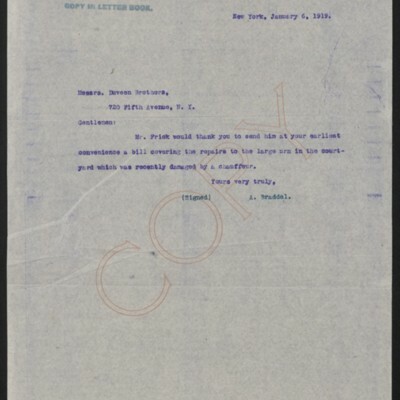 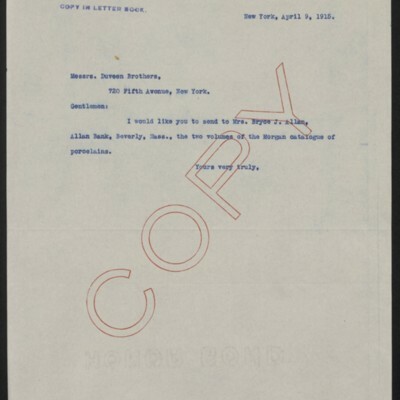 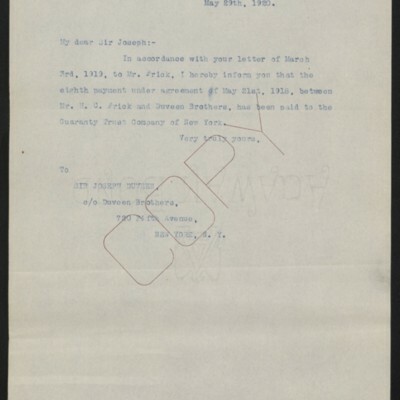 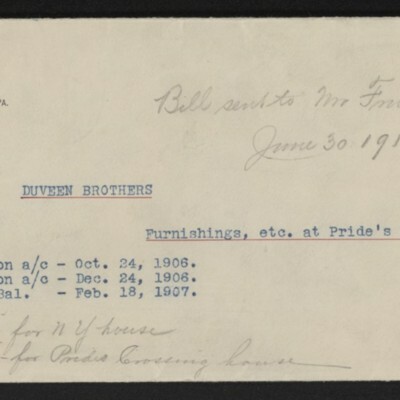 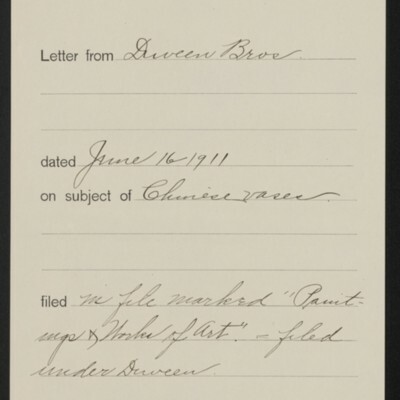 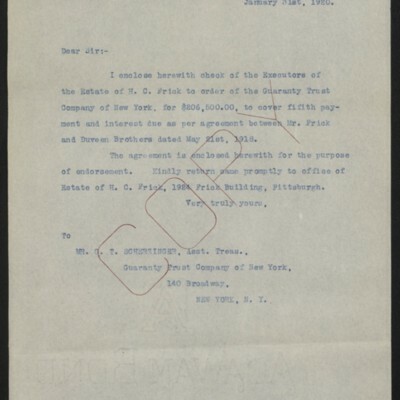 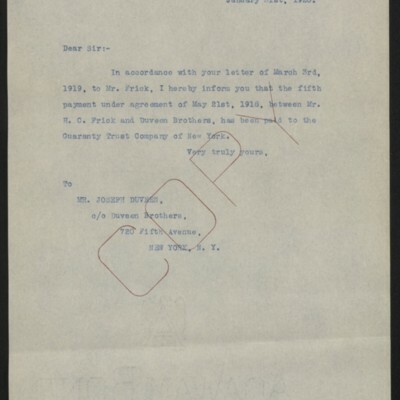 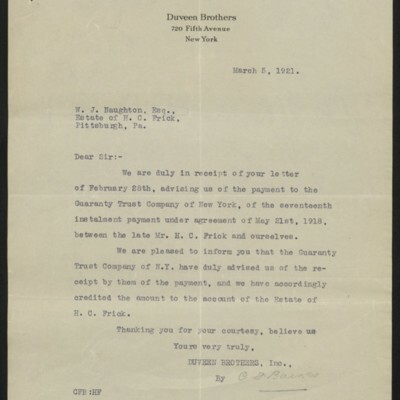 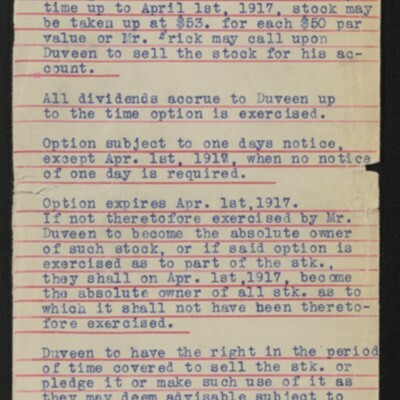 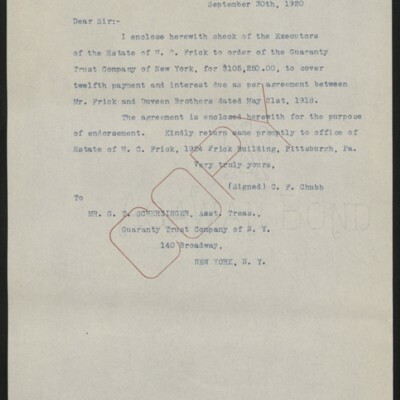 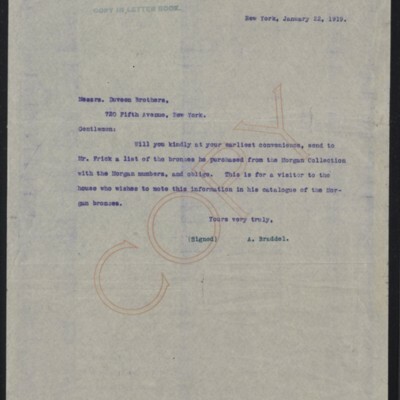 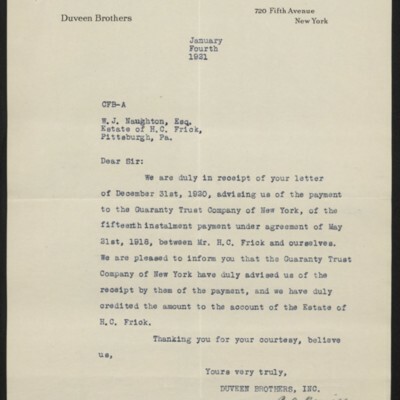 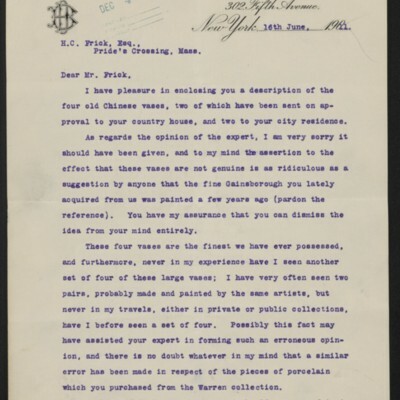 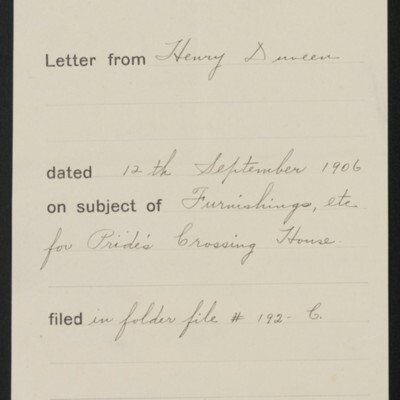 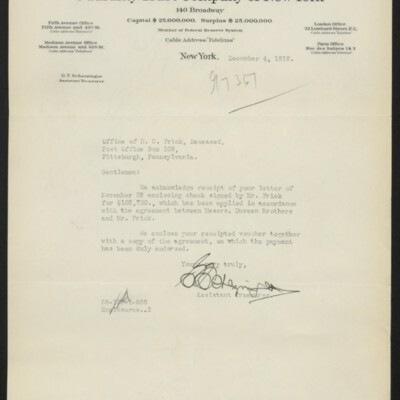 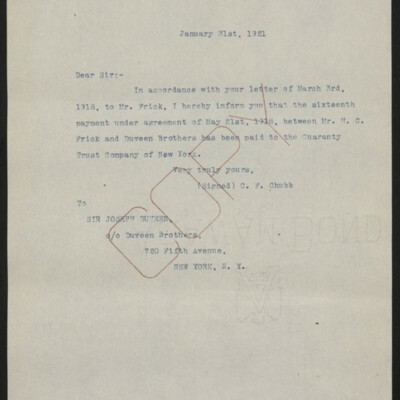 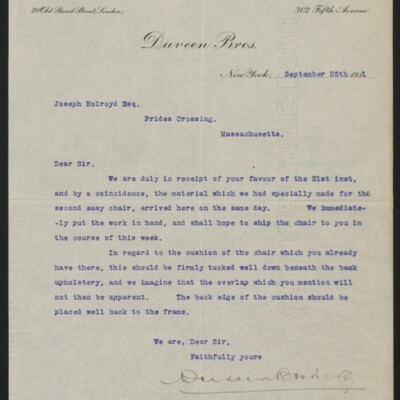 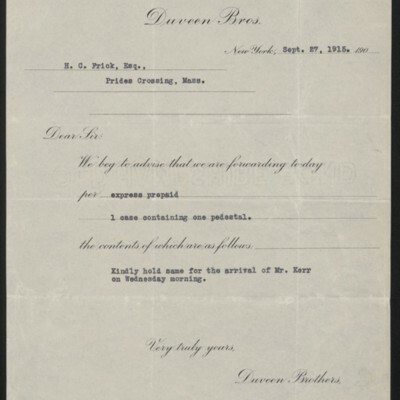 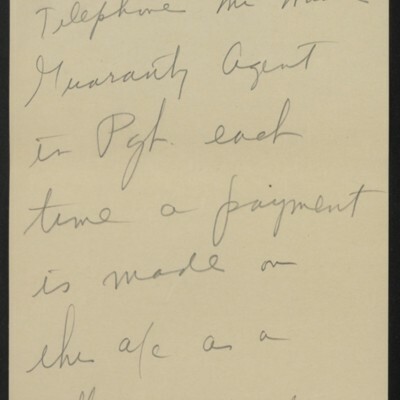 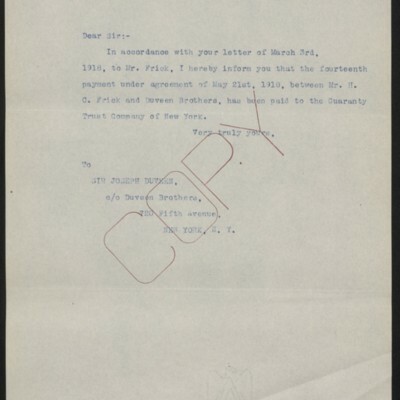 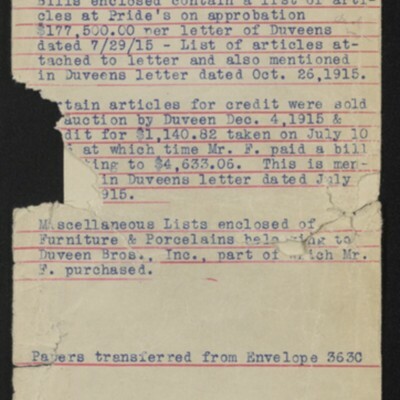 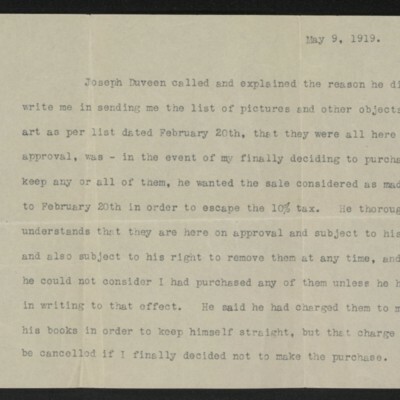 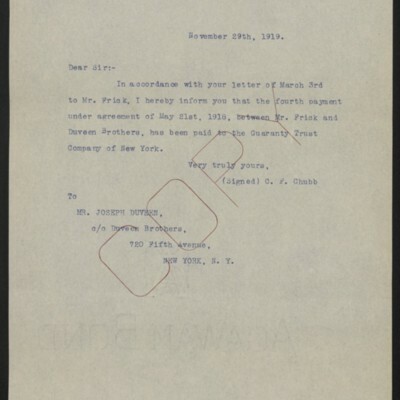 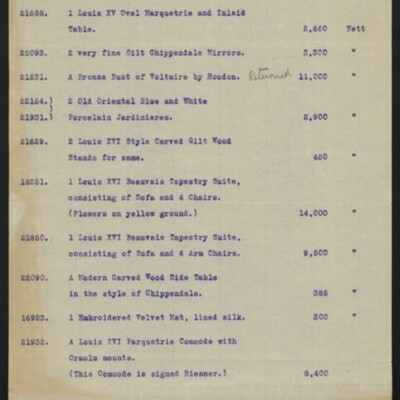 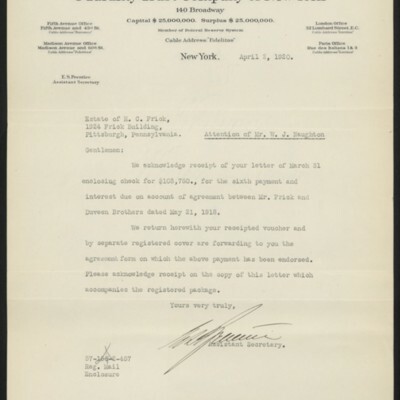 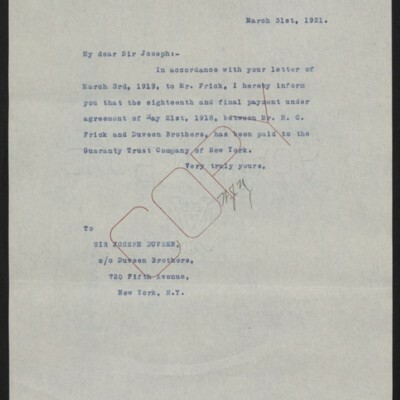 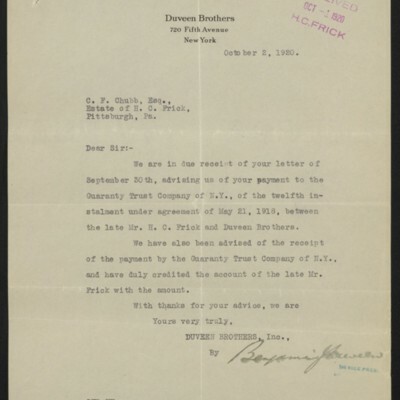 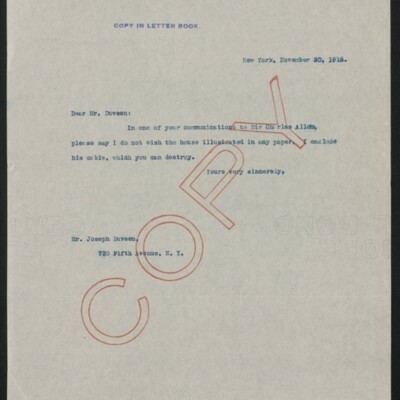 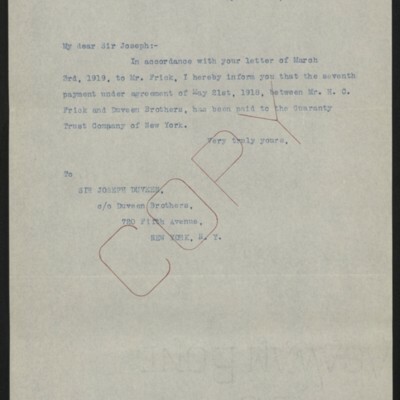 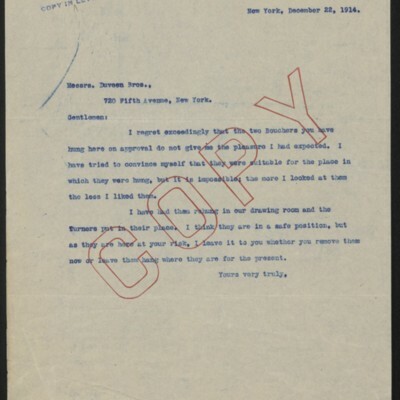 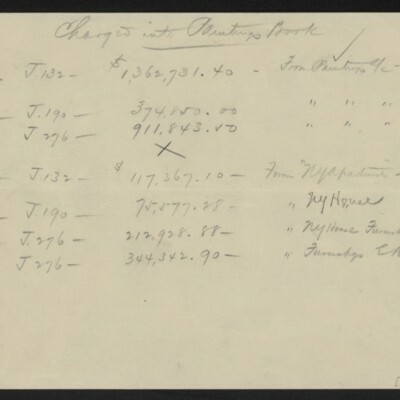 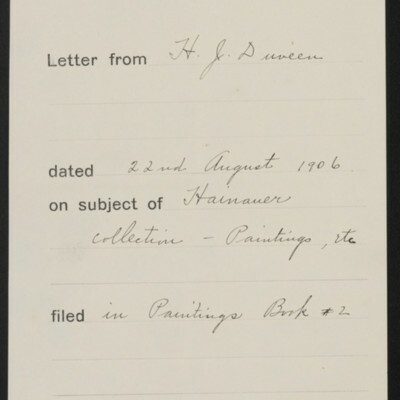 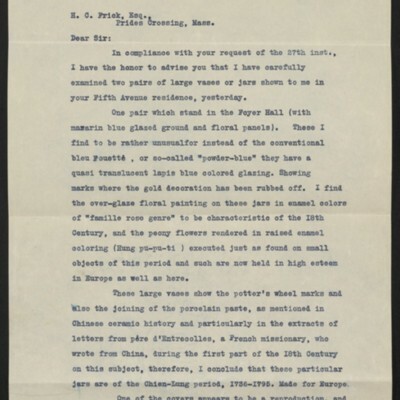 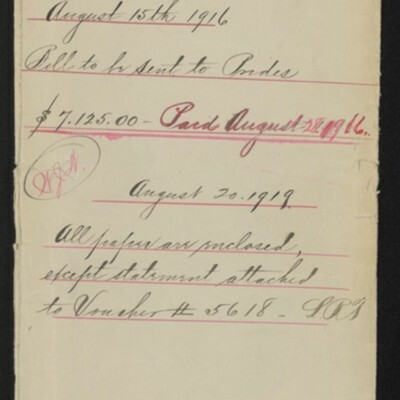 Frick’s correspondence with Duveen Brothers dates from 1906-1919; additional correspondence dated 1920-1921 concerns payments to Duveen by Frick’s estate. 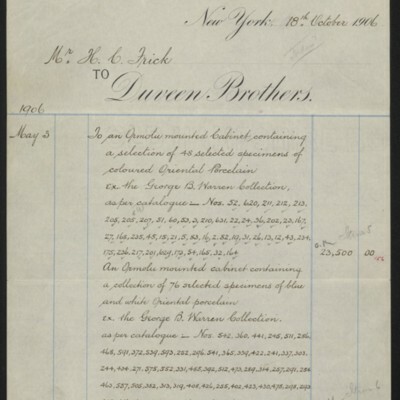 Frick purchased Renaissance bronzes, Chinese porcelains, Limoges enamels, and furniture from the J.P. Morgan estate through Joseph Duveen, as well as the series of panels by Fragonard entitled The Progress of Love. 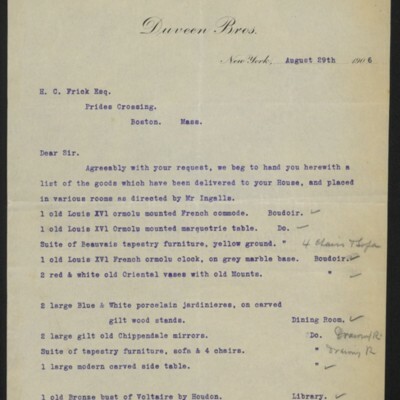 He also acquired rugs, porcelains, and other objects for the Frick family's Massachusetts summer home from Duveen. 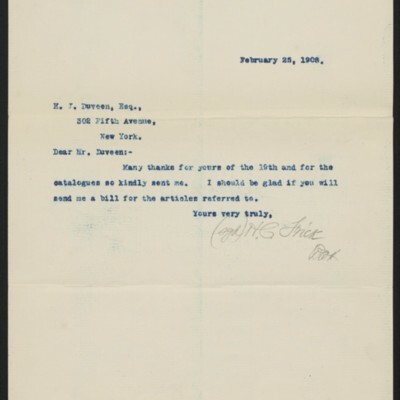 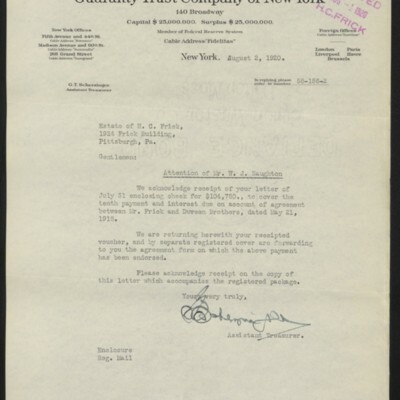 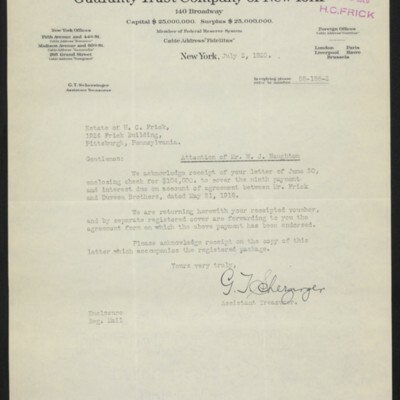 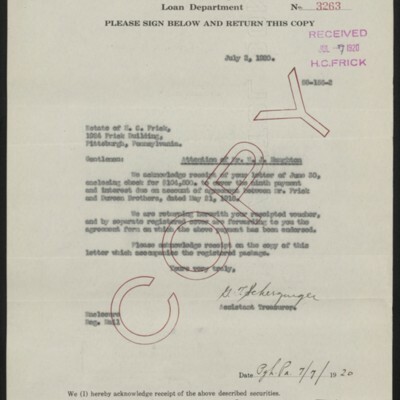 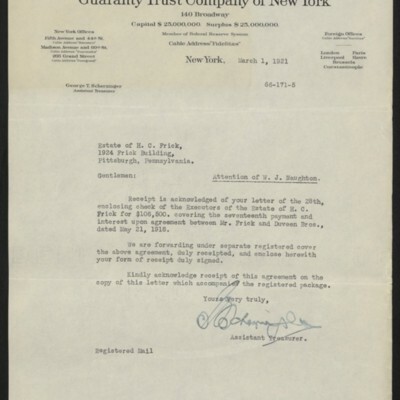 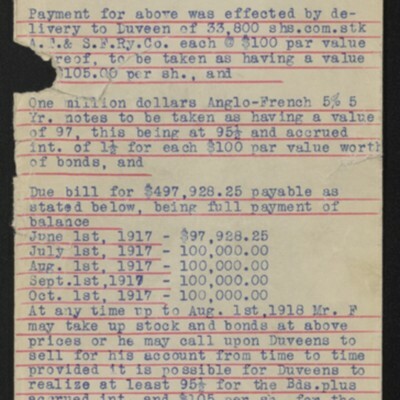 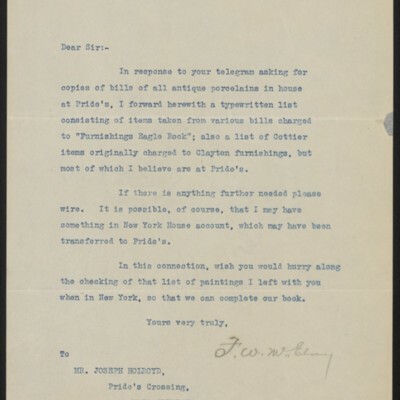 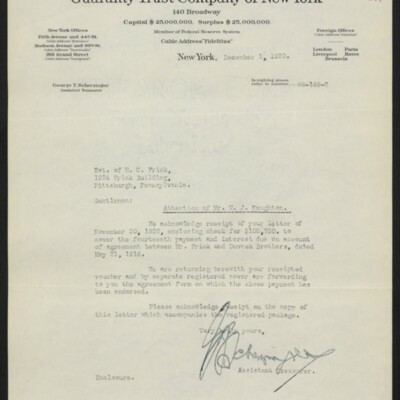 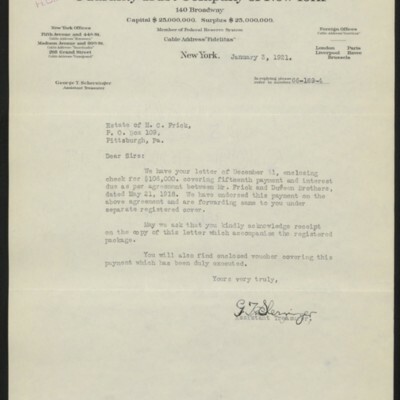 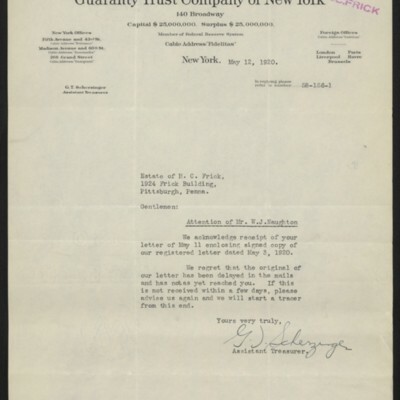 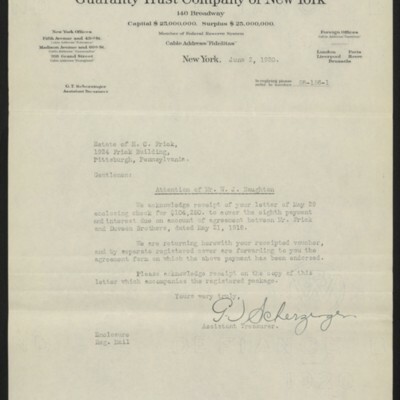 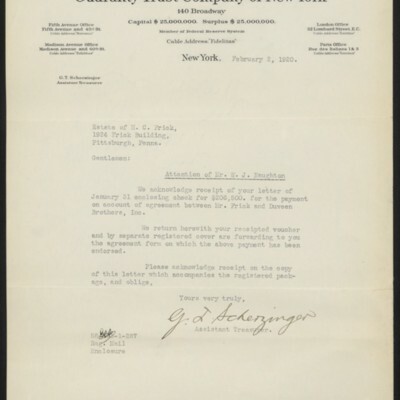 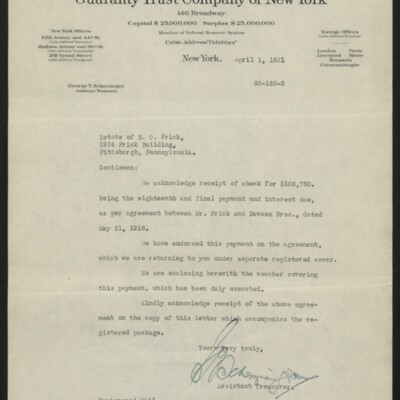 Correspondence concerns art works purchased and offered, and includes invoices.